Six-year-old Alexis likes PE because her teacher makes up fun games. Not that gas in PE isn’t fun. Remember the cool little scooters? And if you didn’t want to get caught underneath the parachute before, just wait until someone pulls the ripcord on one under there! Do you think they put that hole in the middle of the fabric for ventilation? Thanks to Shelley for sharing her daughter’s note with Stuff Kids Write. It’s no stinker, that’s for sure. Please send us funny samples of kids’ writing you catch wind of. Email to mcfadden.chase@gmail.com or leanneshirtliffe@gmail.com. Email Me Stuff Kids Write! Subscribe to Stuff Kids Write and receive notifications of the latest mini-bard brilliance by email. Submit to Stuff Kids Write! Please share with us! We are seeking funny notes, cards, letters, or stories kids have written. 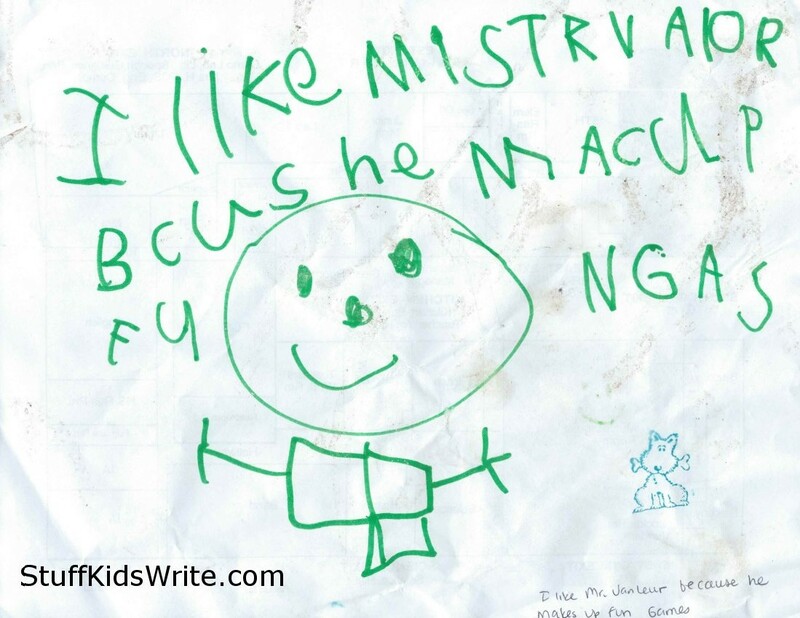 Submissions can be current (scribbled yesterday) or ancient (pulled from the preschool file). To submit, please email the image to mcfadden.chase@gmail.com or leanneshirtliffe@gmail.com. Dads and Grandpas: Bring on the Nair! © Chase McFadden, Leanne Shirtliffe, and Stuff Kids Write 2016. Unauthorized use and/or duplication of this material without express and written permission from this blog’s authors and/or owners is strictly prohibited. Excerpts and links may be used, provided that full and clear credit is given to Chase McFadden, Leanne Shirtliffe, and Stuff Kids Write with appropriate and specific direction to the original content.